Reinterpretation is the focus of Jon Ippolito’s keynote for FUTURE PROOF!? International Symposium on the Preservation of Born-Digital/Software-Based Art at the Stedelijk Museum Schiedam in The Netherlands on 8 February 2017 and of his workshop at the UNFOLD Network Meeting at LIMA the previous day. Precedents for reinterpretation as a preservation strategy abound in the past and present, from the generational re-performance of knowledge in prehistoric Brazil and New Guinea, to the continual reinvention of Baroque music, to reconstructions of 20th-century drawings and installations by today’s artists in Java and Processing. Given the way every recurrence accrues meaning by its associations with past versions, Ippolito asks whether the English idiom of events “unfolding” in time is obsolete. His talk suggests that a metaphor of enfolding with time would be more consistent with contemporary thermodynamics and cosmology–and the necessities of 21st-century preservation. “Permanence through Change” was the concept of a workshop Ippolito gave at the Mexican National Institute of Conservation (ENCRyM), organized by conservator Estibaliz Guzman in Mexico City on October 10th. Other participants included prominent Mexican conservators Nadine Vera and Jo Ana Morfin. Ippolito followed the workshop with a panel presentation entitled “The Art of Re-collecting” at Itineraries of the conservation of documentary heritage: practices and provocations at the National School of Conservation, Restoration and Museology on 10 and 11 November 2016. In her presentation at the same conference, Vera spoke about the challenges of updating a conservation studies program for the age of analog and digital video media. For her part, Morfin, who has studied with the University of Maine’s Digital Curation program, has brought the skills learned there to bear on her position as digital curator and conservator at the Museo Universitario del Chopo, a Mexico City collection dedicated to documenting, exhibiting, and preserving ephemeral and underground art forms from artist-made magazines to punk rock. Organized for graduate students in the National School of Conservation, Ippolito’s workshops offered participants a chance to try cutting-edge techniques of digital preservation. The common denominator among these various techniques, which included 3-D scanning, DNA storage, and emulation, was the approach known as variable media. This philosophy, developed at the Guggenheim in the late 1990s and expounded in Ippolito’s recent book with Richard Rinehart Re-collection, proposes that creative works may best survive by adapting their mediums to the changing technological and cultural context of the future. 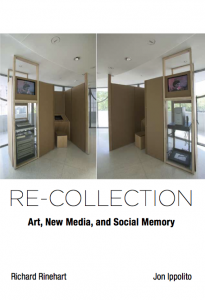 Last fall, Ippolito also workshopped these innovative approaches in “Preserving Differences in a Connected World” at the Play/Back symposium, National Endowment for the Humanities, Washington DC, 30 September, and in “3D Scanning of Museum Objects” at the 2016 Maine Museums and Archives conference on 23 September at the University of Maine. Anyone interested in the theoretical basis and practical application of the radical techniques explained in these workshops can learn more through the University of Maine’s Digital Curation graduate program. Taught entirely online, this innovative program includes a digital preservation course co-taught by Richard Hollinger and Ippolito aimed to provide professionals working in the field with a toolkit for combating the obsolescence of media in their collection.